Incident Details: A lady walking with her partner and their two dogs got on to what they saw as dangerous slippery ground, at the top of Halls Fell ridge, and decided to find an easier way off. 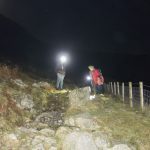 Unfortunately, they chose to try to descend the side of Doddick Gill, which proved to be much more challenging than they expected, and someway down they became cragfast. When contact was first made, their initial position was somewhat uncertain, and as there were three search dogs in base, they accompanied team members to search Doddick Gill from the bottom, while Team members went to the top. 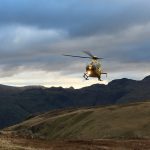 The couple and their dogs were located in the top half of the gill, and were assisted to back to safety on the ridge path after traversing above Doddick Gill. There they met up with the dogs who had been in the lower part of the gill. They were then walked down to the kennels at Doddick Farm, from where they made their way back to their accommodation. 9 Team members – 2 hour 46 minutes.